I always get questions about my Sourdough Tortillas. I first published the recipe together with my Avocado Tacos recipe. However, I decided to write a separate post about it so I could explain a few things a little better. Ok, let’s get to it. First of all, your sourdough starter doesn’t have to be active to make these sourdough tortillas. That means, you can use your discard. Recipes that use sourdough discard are beautiful to me, because I feed my starter so frequently, I always have a tone of it to discard. If your sourdough starter is active, no problem using that either. Go for it! But you don’t have to go out of your way, feed your starter, and then wait for it to be active to start making these Sourdough Tortillas. These sourdough tortillas have a much more beautiful texture compared to the regular flour ones, in my opinion. They are so soft, and taste amazing! By far, my favorite tortillas to make and eat. Depending on your location (altitude and humidity level), what kind of flour you are using, or what kind of starter you have, you might need to adjust the flour quantity. If the dough is too sticky, add some more flour to it. In the instructions, I specify to add only 4 cups of flour to the initial dough, and add the remaining 1 cup as you knead, and as necessary. You don’t want to add way too much flour, this is supposed to be a very soft dough, not too stiff. I keep my starter at 100% hydration, which means I always feed it with equal amounts of water, flour, and starter. So, if I am feeding my starter, I usually discard everything but 100 grams of it, then I feed it with 100 grams of water, and 100 grams of flour. You want to take that into consideration when making these tortillas. In case you keep your starter at a lower hydration level, you might want to add some less flour to the dough. Also, feel free to half the recipe if you don’t wanna make about 30 tortillas. And if you don’t want to half the recipe, you have many options on what to do with leftover tortillas. Can I freeze sourdough tortilla dough? You may freeze just the raw dough if you want to. I actually did that this time to experiment. After making my dough, I let it rise, then I portioned it in half, cooked one half and froze the rest for about 1 week. Then, when I went to use my frozen dough, I let it thaw in the fridge overnight and the next day proceeded to portion it, roll it out, and cook it normally. They came out tasting fresh and delicious! I’d recommend freezing it for up to 1-2 months. Can I freeze cooked tortillas? You may freeze already cooked tortillas. I like to place my tortillas between sheets of parchment paper, then wrap them with some foil, place inside a zip loc freezer bag, and they will keep well in the freezer for about 2 months. How to make tortilla chips with leftover tortillas? 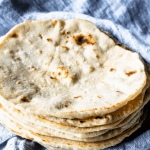 If you have an excess of tortillas, you may slice your tortillas in triangles, then drizzle some olive oil over them and possibly other spices (salt, paprika, garlic powder, za’atar) and bake in the oven until golden brown, about 5 minutes. And you will have yourself tortilla chips! Most likely the best tortilla chips you’ve ever had in your life. So, lots of options here on what to do with all of these sourdough tortillas! This last time I made these delicious Cauliflower Tacos with Avocado Crema. They were so good, it was hard to stop eating them!! The breaded cauliflower was baked in the oven. I added the delicious fresh corn on the cob we got at the farmers market, and it made for a fantastic #tacotuesday! I hope you like my recipe for sourdough tortillas. If you are an avid sourdough baker, I am sure you will! Thanks for reading, and have a beautiful day! If you want to check out some more sourdough recipes, please click here. Also, check out this recipe for my Spinach Tortillas. And if you want to, you can check out my recipe for regular Flour Tortillas right here. And here are some Taco recipes to accompany your Sourdough Tortillas. 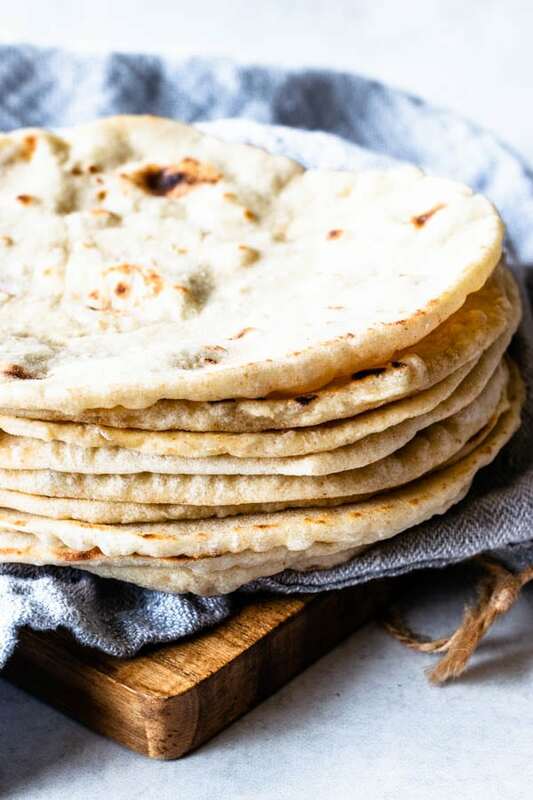 These Sourdough Tortillas are made with leftover sourdough starter. They are soft and delicious, the best tortillas you'll ever have! Mix sourdough starter, water, oil, salt, baking powder, and 4 cups of flour in the bowl of a stand mixer and knead with the dough hook for 4-6 minutes, until dough comes together in a smooth, non-sticky ball. If it’s too sticky, start adding the remaining cup of flour until you obtain the necessary consistency. You may not use the whole cup of flour, so just go slowly until you reach a dough that isn't too sticky or too dry. You can also mix the ingredients with a wooden spoon and then knead by hand. 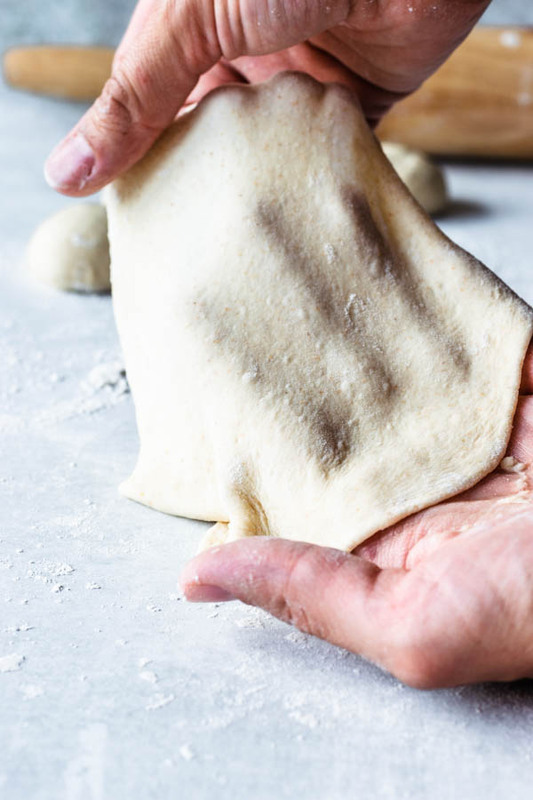 Once you’re done kneading, place dough in a lightly oiled bowl, cover with a towel or plastic wrap and let it rest at room temperature for about 30 minutes. Divide the dough into about 32 equal pieces. I use a scale to measure out my dough and I usually go for 30 grams per piece. 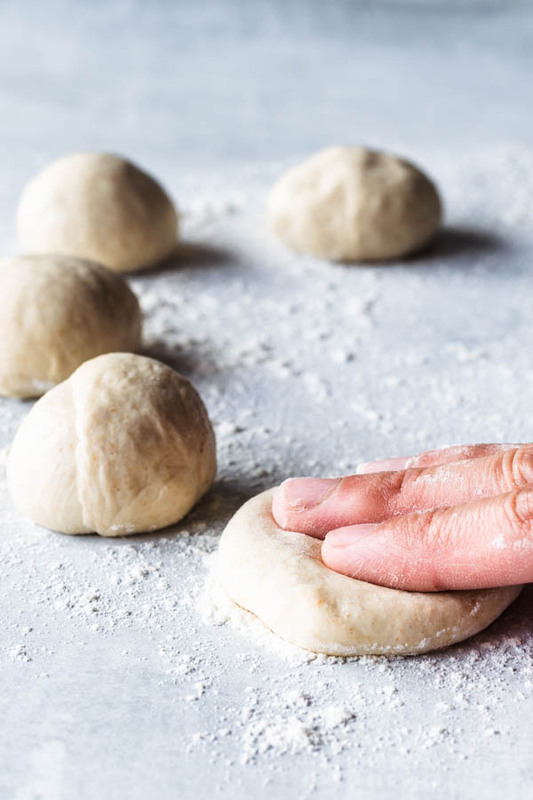 Using the palm of your hands, roll each piece of dough into a ball, by making a circular motion, pressing down slightly on the dough, against the counter. Use very little flour to do this because you need the traction of the counter to shape the balls. Cover dough pieces with a towel and let them rest for 5 minutes. 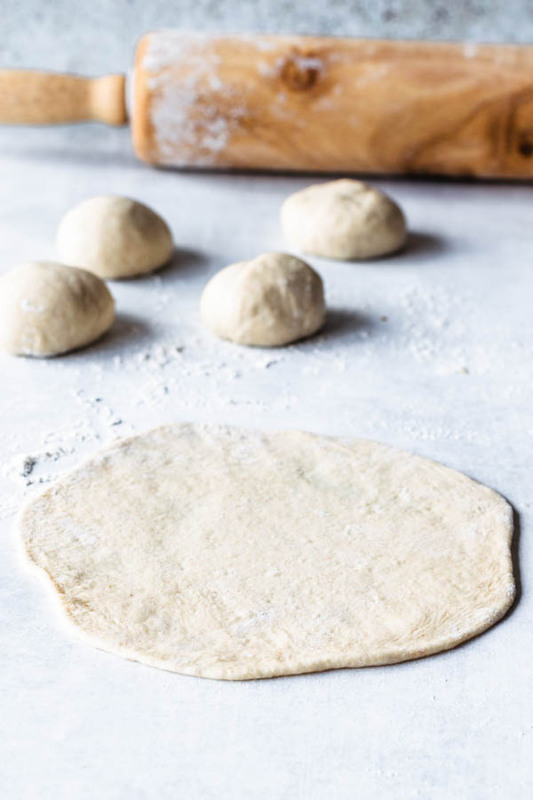 Start rolling each dough piece into a circle that measures out about 7 inches in diameter. I like to roll out as many dough pieces as my counter space will allow me to lay out, before cooking them. I’ve actually already used my pasta machine to roll the dough pieces out too, and it works fantastic, btw! When the pan is hot, add tortilla. Cook on one side for about 1 minute, flip it over and cook on the other side for about 30 seconds. You don’t want your tortilla to burn, so cook it until it’s just slightly browned. If you burn your tortillas, they might become hard after they cool down. Lay out cooked tortillas on a baking sheet and let them cool slightly before placing them in a tortilla warmer or closed container. That’s because if you immediately put the tortillas away while hot, they will become soggy. Wow, these look amazing. 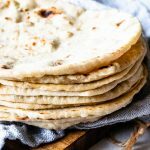 I’ve never tried to make my own tortillas, let alone sourdough tortillas! sourdough tortillas are my favorite to make! thank you Danielle! These tortillas look amazing! Gotta try them! 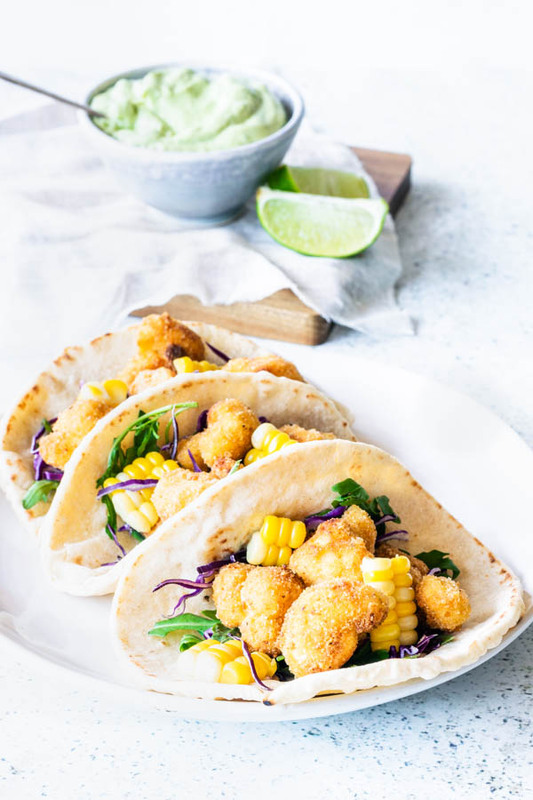 I love homemade shells- they make tacos so much better- and this recipe is one I never would have thought of, but have to try! Thank you! true, homemade tortillas are really a step up! thank you! These look so delicious! Definitely a must-make! Thanks for sharing! Great recipe for using sourdough discard. 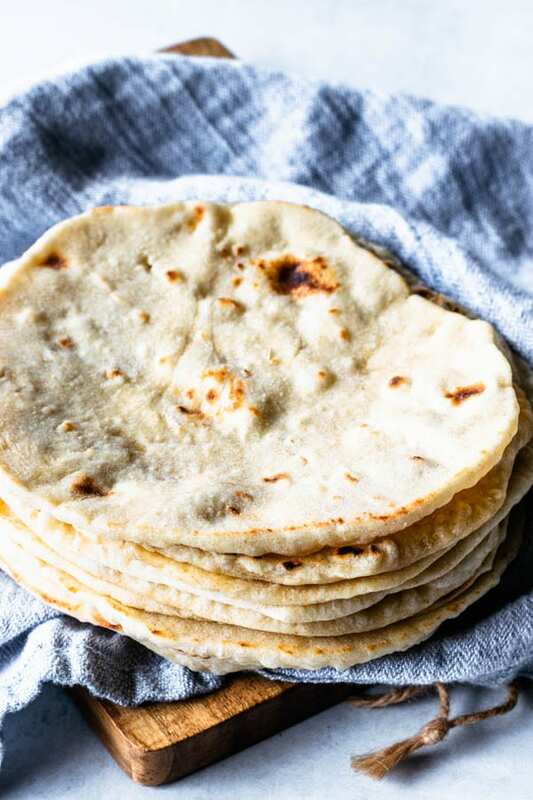 My hubby says these are the best tortillas I’ve ever made! These are my go to when I want homemade tortillas. Thanjs! Thank you so much, these are also my husband’s favorite tortillas!! These went beyond expectations. Most of them got eaten plain out of the pan! Delicious! Ohhh I am super happy to hear that!!! Awesome!!! Thank you so much!!! This was my first time making tortillas and I really struggled rolling them. The dough was very elastic. Any tips to make it easier? That being said, they were delicious and I never want a store bought tortilla again!